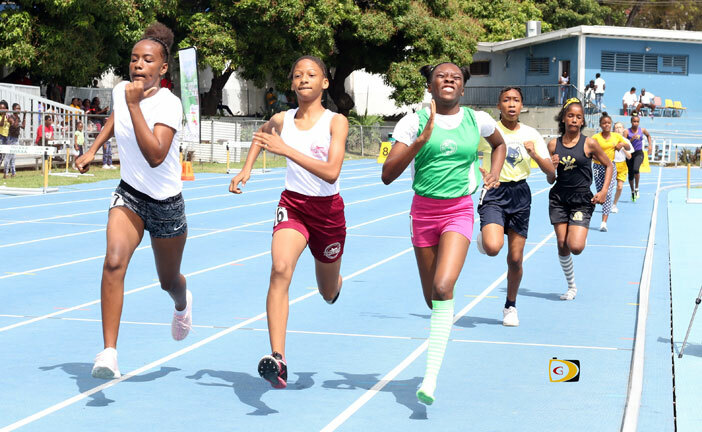 Alexandrian Maduro, led by its Victrix Ludorum K’Zariah Harrigan, reclaimed the Inter Primary Schools B Division crown, its first since 2013, while Althea Scatliffe continued its a Division dominance last week at the A. O. Shirley Grounds. Alexandrina Maduro whose athletes won three of eight division titles on offer, entered the competition in fourth place after pre events on March 8, amassed 304 points for the victory. Joyce Samuel who moved to the A Division this year, was the defending champ. Leonora Delville was second with 268 while pre events leader Ivan Dawson finished third with 257. Virgin Gorda’s Robinson O’Neal Memorial School scored 205 for fourth place, rounding out teams scoring over 200 points. Isabella Morris placed fifth with 190. Sixth came Jost Van Dyke with 162 and were followed by First Impression with 154. God’s Corner Stone occupied eigth place with 107. Pelican Gate had 99 points and Anegada 94 for tenth place while Cedar International School rounded out the competition with 60. In the division championships, Harrigan secured the 13+ Girls Division with 28 points, two better than Leonora Delville’s Erieana Bobb’s 24. D’Naesia Springette of Alexandrina Maduro, gave them their second of the four division titles as stake, winning the U13 Girls class with 26 points, while Leonora Delville’s Natalia Drayton claimed the U11 Girls Division with 26 points, two better than Jost Van Dyke’s Laila Penn. Shyann Tomlinson of Claudia Creque had 20 points for the U9 Girls Division title. Isabella Morris’ Malaki Smith won all his events to claim the 13+ Boys Division crown with 30 points. Shakari Maduro of Alexandriana Maduro, was the U13 class winner with 24, while Robinson O’Neal Memorial School’s Sean Samuel won all his events for the U11 Boys title with 30. T’Sean Smith of Lenora Delville, had 26 points to win the U9 Division. Isabella Morris’ Malakai Smith and Robinson O’Neal Memorial School’s Sean Samuel, were the respective Victor Ludorums with 30 points and Alexandrina Maduro’s K’Zariah Harrigan the Victrix with 28. While Althea Scatiffe—the territory’s largest school which has never lost since it was formed in 1983 dominated the A Division competition with 433 points—the real battle was among the other seven teams. Althea Scatliffe’s Nickelia Drummond, won the 13+ Girls Division with 30 points. Teammate Kalia Martin was the Under 13 winner with 28 points. Enis Adams’ A’Sia McMaster edged Althea Scatliffe’s Jahkyla Morton for the U11 Girls crown, 28-26. M’Kenzii Crabbe of Joyce Samuel and Carey-Ann Mickie of Bregado Flax, were joint U9 Girls winners with 18 points respectively. Francis Lettsome’s Kadeem Pena had the top score in the 13+ Boys Division with 30. Kadair Maduro of Ebenezer Thomas also registered 30 points in the U13 Boys Division. Althea Scatliffe’s Tiondre Frett had 28 points in winning the U9 Boys Division. Francis Lettsome’s Kadeem Pena and Kadair Maduro of Ebenezer Thomas, shared the Victor Ludorum award with 30 points respectively. Althea Scatliffe’s Nickelia Drummond amassed 30 to seal the Victrix Ludorum.